Chia Bomber 2, the game where you purposely launch water balloons from a bazooka at those that would dare stand in your presence. In the game you play your average little pet named Geoffrey Chia who's busy fighting back against an assault from dozens of Chia Bombers bent on generally making a mess of his neighborhood. It's a normal action game where you fire at the bad guys and they fire back at you while you dodge this and that to advance to the next level, but still quite a fun game which, once you master it, can bring you up to three thousand Neopoints every day. In this twelve-level game you control Geoffrey with the arrow keys on your keyboard and shoot his gun with the space bar, as with almost every action game in Neopia (you have an unlimited amount of water balloons with which to fire). Mines are another type of weapon you have which, once you drop them, stay where they are until a Bomber happens to find and step on one. It doesn't even matter how many hit points he has; if he touches one then it's kablooie for him, although you get less points from a mine. Deploy them by pressing the M key and remember that you have a limit to five per level; don't worry, they won't blow up Geoffrey if he steps on one. Unfortunately, the Chia Bombers can drop their own which are the opposite of yours and they have a limit of three per Bomber. 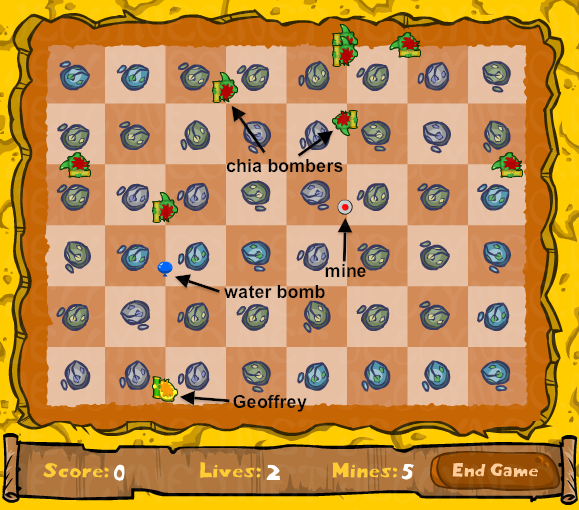 The Chia Bombers have a limited range that increases at level six and level twelve; plus, there are eight Bombers to deal with up until level eleven, when another one joins the party. On the next and final stage, level twelve, there's one more to continuously nail for you to win the game. So all you have to really remember is this: the M key drops a mine, the space bar fires Geoff's bazooka and the arrow keys move him while the levels keep getting harder and harder. Very, very simple. There are a total of five different types of Chia Bombers, each color meaning a different amount of hit points left for ol' Geoffrey to soak. When you hit one, they'll downgrade to the Bomber listed before it, unless it's a Green in which case it'll have just been defeated. Green: the weakest of all Bombers, the Green one has only one hit point and is extremely easy to finish off. Blue: two hit points, but still not much of a threat. Yellow: three hit points and where the Bombers start to get tough; this one isn't too bad but the next ones are. Red: four hit points of pure annoyance. This Bomber is quite a hassle as it can take quite a number of blows before it goes down; beware. As soon as you start up the game, start shooting all of the Chia Bombers (all green at this point) and before you blast the last one get to the very top of the screen and then finish him off. While you shoot, keep moving right, stopping only when you're about to collide with a Bomber. Watch out for them, though - they're sneaky and can creep up on you! Yes, there is a legal cheat for this game! Just type "geoffrey" anywhere in-game, even if between levels, and you'll get an extra life; this is the way you see that puzzling score of 1,687 in the High Scores when you can only get a hundred points below that. Yay for legal cheats! And that ends this guide that will hopefully get you through Chia Bomber 2 with at least one life left. Gudda lucka and gudda bya!